Rebecca George-O'Hearn on an elliptical trainer. I live in a place where skating is only possible seven months of the year. Snow covers our roads from about November through April, and we don't have any place nearby to skate indoors. But that doesn't stop me from doing my best to stay in shape. I do a cardiovascular workout for 50 minutes five times a week. I use an elliptical trainer, but you can use whatever equipment you prefer. Two of the five days are devoted to "easy pace" workouts. On these days, I maintain an aerobic heart rate — elevating it, but not so much that I can't hold a conversation. The other three days I do interval training, which approximates life in a pace line. I get my heart rate up to a very uncomfortable level (anaerobic) for about three minutes, then come back down to race pace for about five minutes. I repeat this sequence for the entire 50-minute session. There are many ways to do intervals, and you should do what works best for you. But I always make sure that at least once in my interval workout, I push myself to my maximum heart rate. Otherwise, I'd have a steep climb to get into race shape in the spring. 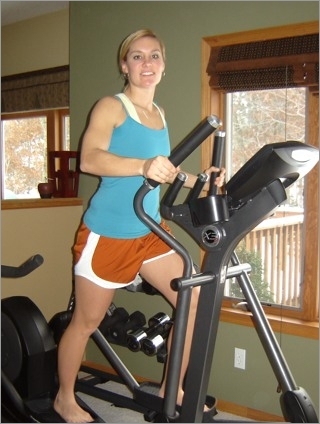 An elliptical trainer, or any other stationary fitness equipment, is no substitute for skating. But, if you can't skate or want a change of routine, using fitness equipment is a great way to achieve the same heart rate goals and get a great workout. I love the outdoors, even when I can't skate. Whenever I get a chance, I go skiing and snow shoe running. It really doesn't matter what activity you do as long as you apply the same training strategy. I can do cardio and interval training on the slopes, in the snow, or on my elliptical trainer at home — whatever fits my mood. 1-leg jumps: 2 sets of 15, each leg. Stand on one leg, dip down to 90 degrees, jump vertically off that leg, land, and repeat. 1-leg squats: 2 sets of 15, each leg. Stand on the edge of a chair, on one leg squat down to 90 degrees, and come back up. 3 minutes of low-walk lunges. 3 sets of 50 double-legged forward hops. I space five books evenly in a straight row, jump over them in one direction, and then turn around and come back. This exercise is a great power builder! Jump squats: 3 sets of 15. Stand with feet shoulder width apart, get into squat position (legs 90 degrees to the floor), jump explosively straight up, land again with legs at 90 degrees, and repeat. Whatever you do, don't let the cold winter months put you in a fitness funk. Set your sites on your first spring race, focus and grind it out. When the snow melts, you'll be fit and ready to go.